Let's face it, many people are horrible at calculating a tip. Not only is the math sometimes challenging, there also is the added pressure of trying to quickly calculate 18 percent of $17.23 while your dinner party stare you down because everyone but you is ready to pay the check. Don't sweat it the next time you go out to dinner, come prepared with Tipcognito, a handy tip calculator that is disguised as an email app. Tipcognito has the visual appearance of an iPhone app but cleverly uses the search field, navigation buttons and fake email entries to display the tip and the total amount you should pay. To use Tipcognito, just enter in the bill amount in the search field and use the "+" and "-" buttons to adjust the tip percentage. 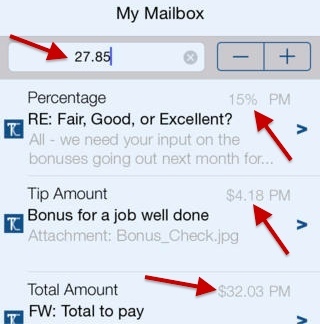 The tip amount and your total payment (bill + tip) will replace the date and time stamp in a normal email. Tipcognito is a wonderful app for those times when you want to calculate a tip quickly and discretely. It is available in the iOS App Store as a free app with advertisements or a paid app without ads (US$0.99). It is compatible with the iPhone and requires iOS 6 or later. 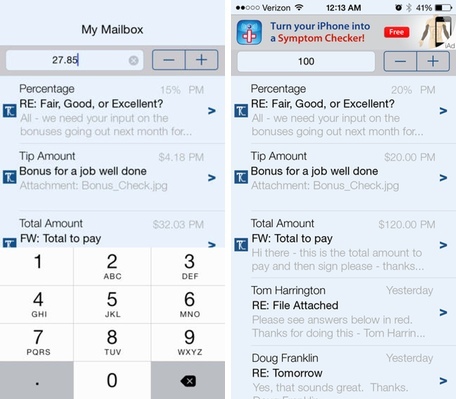 Daily App: Tipcognito is a tip calculator masquerading as email client originally appeared on Breaking Apple News, Tips and Reviews from The Unofficial Apple Weblog on Wed, 23 Apr 2014 09:00:00 EST. Please see our terms for use of feeds. Download Tipcognito from the iTunes store.